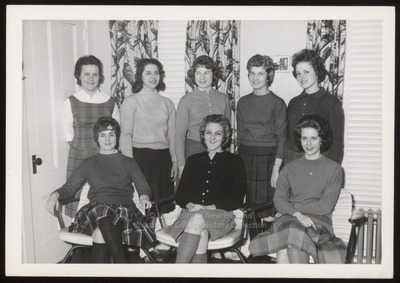 Eight residents of Donnelly House, Westbrook Junior College, pose in this black and white photo by The Wendell White Studio, Portland, Maine, with Tower 1961 written in pencil on the back. Members of the newest house on campus, a mixture of freshmen and seniors, are: Row 1: S. McCarron, L. Casey, G. Daffinee. Row 2: L. Schneider, S. Rodenstein, K. Burr, G. Younker, C. Bennett. This photo appears on page 56 of the 1961 Tower yearbook.